SUB: FPJ, Mar 19,2012; TOI, Mar 19,2012: Manori- Gorai- Uttan draft plan to State Govt. The hearing for the much controversial Gorai- Manori tourism recreation zone plan has been completed and the Mumbai Metropolitan Region Development Authority ( MMRDA) committee would be submitting their report to the state government in a fortnight.
" We have heard the suggestions and objections of the people and now are in the process of preparing the report and would submit our recommendations to the state government for their final approval," said MMRDA Commissioner Rahul Asthana who is heading the committee. MMRDA is the special planning authority ( SPA) of the Manori- Gorai- Uttan ( MGU) area and had prepared a draft development plan of the same. However they had received a mammoth 16,000 suggestions and objections as most of the people had vehemently opposed the entry of MMRDA itself. While most of the people have objected to tourism zones and have demanded that it should be kept as no development zones. There have also been objections on the development of roads and other amenities, as the locals want minimal concrete structure in their area. Surprisingly there have also been some suggestions to increase the floor space index ( FSI) in many places. Currently the FSI is maximum up to 1 and that to in development areas while in rest of the place its around up to 0.5. At some places which are already inhabited, MMRDA had kept is as NDZ and there have been requests to keep them as development zone. " Many people own plots in these areas and want to develop commercially and some of them being private developers could not be ruled out," said Asthana. The total population the MGU area is around 38,000 with majority of them involved in the fishing business. However the development could also bring roadblocks to their daily routine lives and the authority would have to take into consideration their opinions seriously.
" Whatever the MMRDA plans, they should keep in mind the interest of the people and not of the builders," said Sandeep Gupta, a local of Manori. MMRDA had also made reservations for developing recreation zones, jetties, picnic spots, and water sports in addition to an Indian Cultural Centre at Gorai to study the cultures of ancient India. MUMBAI: The Gorai-Manori region could get wider roads and higher buildings if the state agrees to recommendations made for the area's draft development plan. MMRDA commissioner Rahul Asthana said he has received requests for changes in the suggestions and objections. A list of final recommendations will be sent shortly to the state government after scrutinizing these requests. The MMRDA's draft development plan, seeking to make the area into a tourism zone, was announced recently. There were over 16,000 objections and suggestions by local residents and organizations. Asthana said the locals have made it clear that they are not interested in building of new roads in the area. The Woes of Gorai is ever increasing. Much of their livelihood has been affected by the forming of Essel World. Their sea route used to be blocked in order that the boats of Essel world may pass. Their Fishing nets destroyed. Their fish dissappearing with the constant sounds of the boats going to and fro. It is now a jolt out of the blue, that their area has been declared as a SEZ (Special Economic Zone). Today the lush greenery, the homes, the villages, the occupation exists. Everyone knows, each and every village in this Manori Gorai belt. A lot of funcitions are held, even till late night, road side crosses exists. The same could be said of the islands of Bombay about a hundred years ago, the same could be said of Salsettle about 50 years ago. Today, no one knows of the original villages, no one knows of the original inhabitants, no one knows of their livelihood, houses, culture...The road side cross are now demolished, by saying they have "encroached" public space. One cannot have their Umbrache Paani late at night as there is sound restrictions. One cannot have processions without permissions. Gorai - Manori is our Last Frontier. If Gorai is lost, there will not be a single recognizable East Indian village. And a few year down the line, history will be edited to show that Bombay never ever was originally Christian/Catholic. It is time we stand and support our fellow East Indians who have been protesting and protesting against this rampant injustice. The serene Gorai  Uttan belt, the Mumbaikars ideal spot for picnics could be the next Nandigram in Maharashtra. The lush green countryside, an abode of over 1.25 lakh Catholic farmers and fishermen, is caught in the net of the SEZ Act and is in the process of being handed over by the State Government to Pan India Paryatan Limited (PIPL), the group that owns Essel World and Water Kingdom, to be developed into a Recreation and Tourism Special Economic Zone. The locals are beginning to realize the impact this development is going to have on their lives and are planning to fight tooth and nail against its implementation. The editor of Christian SPOTLIGHT Mr. Gordon DSouza and his colleague Mr. Walter Murzello spent time with the locals and tried to understand the implications of this project. Ø The Uttan-Gorai belt also called Dharavi island consists of ten villages namely Dongri, Pali, Tarodi, Chowk, Uttan, Gorai, Manori, Rai, Morva and Murtha. Ø These are the only villages left in proximity of Mumbai. Manori, Culvem and Gorai are in Mumbai Municipal Corporation jurisdiction. Ø The population is predominantly Catholic (90%) and is engaged in agriculture and fishing. A few having strategic locations have built resorts and cater to picnickers. Gorai has 99% Catholic population. Ø The beaches and mangroves are extensively used for fishing. Ø The Gorai-Uttan SEZ is the second largest in Maharashtra. o The people will lose their homes and occupations. As per a Government reply to the President of DBBS there is no plan for rehabilitation. o The culture and language that has taken thousands of years to develop will be lost in one stroke. o The residents will lose their means of livelihood. o The shrine of Our Lady of Vailankani at Bhatte Bunder, which was built recently with a cost of over a crore of rupees, would be under threat. o If the people lose their homes the present churches in each of the villages would be reduced to monuments. o How can Kolis be rehabilitated away from the sea. It would herald the end of Koli and Kunbi Samaj. The over one thousand year old culture of the locals would be wiped out with the execution of this project. o Is the community being made a soft target because they normally dont retaliate? 90% of the population is Catholic and the community in this area will disintegrate if the Government hands over this beautiful virgin land to the developers. o Is this a return to the feudal system where the people in the lower rung are treated like dirt while the business class gets preferential treatment to get richer? o There is bound to be resistance and the police could use force to evict the locals and this may lead to a Nandigram like situation which is likened to the Jalianwala Baug massacre or the shooting at Tiananmen Square. Efforts should be made to prevent the impending bloodbath. § Over 10,000 objections to the Government Notification were filed by the locals through the recently formed organisation Dharavi Beth (island) Bachav Samiti (DBBS). 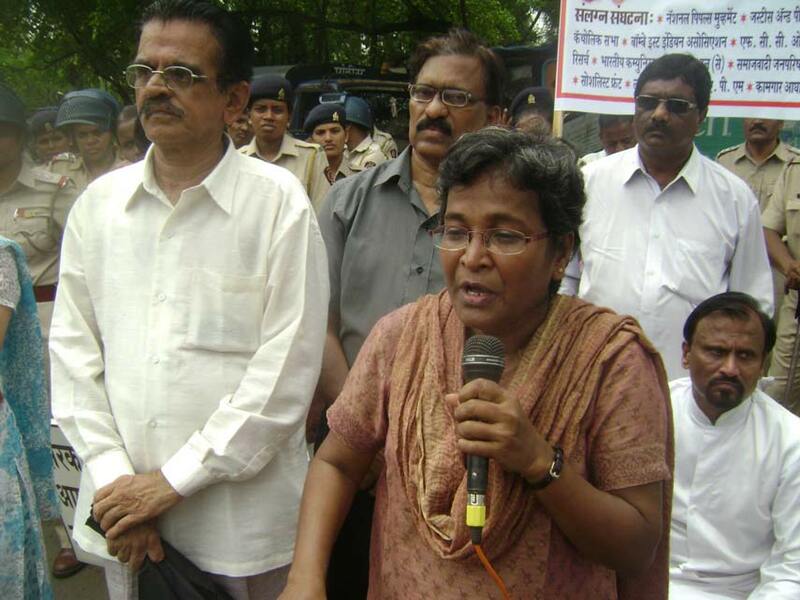 § Participated in various Protest Meetings and Rallies in places like Penn etc in Maharashtra. § A Protest Rally was organized at Gorai Church grounds where Fr. Francis de Britto, Adv. Vivek Pandit of Shrammik Mukti Andolan and Ulka Mahajan of NEPM addressed the gathering. § As part of the State Yatra a Protest Rally was organized at Uttan on Jan. 4, 2007 that drew very large crowds. § Planned a Rasta Roko at Bhoot Bangla, Uttan on 23rd March 2007 the death anniversary of Shahid Bhagat Singh. 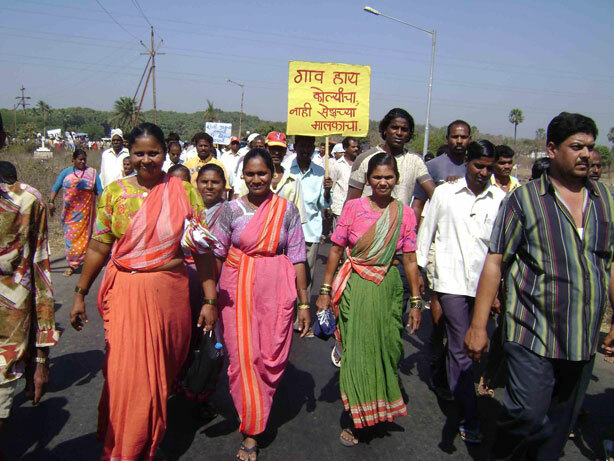 § Participated in the All Maharashtra Protest Rally organized by the Jagati Karan Virodhi Kruti Samiti at Azad Maidan on April 5, 2007. The locals organized 45 bus loads of people from the villages for the Rally. SEZ has now become a human rights issue. The National Human Rights Council has served a notice to the Centre over displacement of farmers due to land acquisition. The Calcutta High Court Bar Association has decided to file a PIL on Nandigram. According to their team members a number of women were raped by policemen and others. à There is a need to increase awareness about the Uttan-Gorai belt situation in the public so that they can put pressure on the Government. à Approach International Human Rights Organisations to intervene in the matter. à There are differing opinions amongst Parish Priests of Churches on the island. It is important to get all of them to support the Protest Movement. à Organise Protest meetings in other parts of the Archdiocese. à Put up posters in every parish, make announcements and undertake signature campaigns to support the cause of the locals. à Put pressure on the Government through letters to the Chief Minister and the local MLAs and MPs. à The locals demand to know if religious bodies of other religions would sit as mute spectators if the lives and properties of their community were in danger. à The locals so far have depended on funds from their own pockets. They are in need of both monetary and moral support. Fund collection drives to support the efforts of the DBBS could be organised. On Sept. 29, 2006 the Chief Minister together with the Industries Minister and Tourism Ministers, Chief Secretary and other senior officials had a meeting with the Pan India Paryatan group and have given the following consent after seeing the plans which were presented through a Video CD. (Copy of the minutes of the meeting is available with Christian SPOTLIGHT. That 5740 hectares (14178 acres) of land comprising 10 villages be allotted to Pan India Paryatan Limited for development into a Recreation and Tourism Zone. 60% of this land i.e. 8606 acres would be Government land which is in possession of MMRDA. They would transfer it to the MTDC which would further transfer the same to the nodal agency PIP Ltd.
40% of the land i.e. 5672 acres would come from private owners who mostly comprise of farmers and fishermen. The coastal stretch 2 km in width from the line of High tide and into the sea and around 18 km long from Manori to Chowk would be handed over to PIPL. The MTDC is authorized to give notices for acquiring lands. Brokers would be used to acquire lands and prices wouldnt be as per Government reckoner. A Notice as per Government Gazette dated 30th Nov. 2006 was published in various newspapers asking members of the public for suggestions and objections against plans under consideration within 60 days. To support the Recreation and Tourism Development the thrust would be on building Transport Facilities, Elevated Bridges, Waterways, Bandra to Manori Freeway, General Purpose Vehicles etc. The PIPL will invest Rs. 500 crores in developing the zone that promises to be Disneyland and Hollywood rolled into one. By locating the venture in a SEZ, Essel can avail of 100 % income tax exemption for the first five years and 50 % in the next five years. It will also enable to import equipment and machinery free of duty. The Gorai SEZ proposed on 1000 hectares in the coastal regulatory zone was approved within 72 hours when several state and central government agencies have given a contrary recommendation. The gap between the date of application (March 14, 2006) and the date of approval (March 17, 2006) is only three days. Worldwide there are only 393 SEZs but the central government has approved as many as 467 SEZs till date in 6-7 months. The residents of Gorai already have a longstanding bad experience with PIPL the developers of Essel World since 1986. Essel World till recently were using water and electricity meant for the village. They have not kept up their promise of employing locals. They have done so only for menial jobs. First Essel World was built on 60 acres of land on the leeward side of Gorai and then the PIPL acquired 700 acres of mangroves in 1997 and has steadily caused enough damage to it. The mangroves are the breeding ground for fish and protect against tidal calamities. In 1998 JCBs were used at night to build the bundh. The church bells were rung and parishioners of Gorai and Culvem assembled to stop the illicit activity. The Bundhs stops the free flow of water through the mangroves causing its slow death. In 1998 on the recommendation of Fr. Francis de Britto of Vasai the Gorai Bachav Sangharsh Samiti was formed. In 1990 Subash Chandra Goyal CEO of PIPL promised a school and dispensary for the locals but the promise was not kept. To protest against the damage to the nets of the fishermen, on July 8, 2001 boats were used by the locals to block the Essel World ferries carting people from the Marve and Gorai docks to the Essel World. The mangroves have been mysteriously damaged due to chemicals in the past. The Bombay Environmental Action Group (BEAG) stepped in. There was uproar over the environmental damage especially after the aftermath of the tsunami. 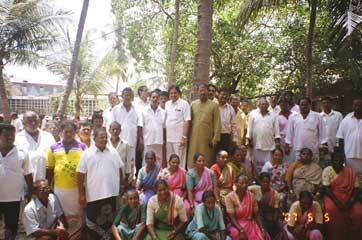 The Gorai Machimar Samiti won a long standing case in the High Court regarding the bundh. The Court ordered inlets to be made in the bundh for free flow of tidal waters. However the PIPL has appealed against the order in the Supreme Court and the matter stands as status quo. The PIPL through its repeated complaints to the police had succeeded in getting Peter Godinho, a leading activist of the village, externed. However the Samiti succeeded in revoking the DCPs order by successfully appealing against it in the Bombay High Court. Both Sonia Gandhi and President Abdul Kalam have said that no farmland should be used for SEZ. Yet there is no formal promulgation on the same and business houses are availing of services of brokers and are using coercive means to get the lands. Christian SPOTLIGHT is grateful to the President of the DBBS Mr. Joseph Gonsalves who is also a Municipal Corporator from Uttan Pali, the Secretary of DBBS Ms. Lourdes DSouza who is also a social activist from Gorai, Mr. Noel Kinny the President of the Gorai Machchimar Samiti and Mr. Paulu Colaso the Vice President of GMS. The above mentioned details have been compiled after extensive interviews with them. Fr. Anselm Gonsalves- Parish Priest of Holy Magi Church, Gorai was very cooperative in giving us his inputs. 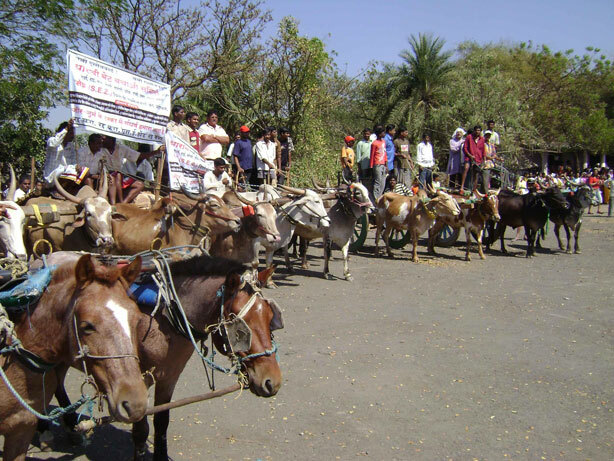 People of the Gorai-Uttan belt gathered in large numbers to protest against SEZ at a meeting in Holy Magi Church Hall, Gorai on May 5, 2007 with the State Minorities Commission. The Commission had summoned the Municipal Commissioner of Mira Bhayander, the Deputy Collectors, Tehsildars and officials from MMRDA for the meeting. Naseem Siddhique, the Chairman of the Minorities Commission questioned the officials as to how the locals were not taken into confidence about implementation of SEZ in their area. While addressing the gathering he said that the decision of acquiring lands should not be implemented unless two-thirds of the locals agreed to it. Why destroy villages with rich heritage and hundreds of years of culture? he said. Parallel cities could be established on lands where there was no habitation. There should be no progress at the cost of the poor and by rendering thousands homeless. Government lands should be used for government schemes to benefit the poor and not for favoring foreign tourism. Noel Kinny, the President of the Gorai Machchimar Samiti said that they did not want to become slaves of a new regime and the new employment that was promised would never match up with the income they were getting from their present occupations. Sr. Kalpana of the Daughters of the Cross said that she teaches children how to preserve the environment but with the implementation of the project the children would be subjected to seeing the reverse happening. Fr. Anselm Gonsalves said that on one hand the Government wants to preserve culture and heritage but on the other hand they are ready to destroy it. Paul DSouza expressed the fear that the locals would suffer similar fate as the sons of the soil have in the island city and the suburbs of Mumbai. Melcy Kinkar of Adivasi Sanghtana said that their farmlands were precious to them and they would not give away even an inch of them. Bhaskar Bhoir who came from the Salt Pan areas of Rai Murda said that they would not give up the occupations which had fed them for generations. Joseph Dias of CSF pointed out that the SEZ in this belt was clearly marked for multi products, though it is being touted as an area for entertainment and tourism. Lourdes DSouza spoke about Goraikars longstanding tryst with the Esselworld group who set up base, on a small plot of land on the leeward side of the island, twenty five years ago. She also spoke about the agitation the Dharavi Beth Bachav Samiti (DBBS) has led ever since SEZ on their island was announced. Mr. Joseph Gonsalves the President of DBBS said that the phrase Dhobi ka kutta na Gharka na Ghat ka aptly described their situation if SEZ is implemented in their land. He gave a detailed account of how SEZ would ruin the lives of the locals if implemented on the island. He said that no amount of money given by the nodal agency PIPL would improve their lot as they possessed small holdings that was further divided and subdivided in the family. Many of the lands used by them are not yet regularized by the Government. SEZ would lead to disintegration of their community both economically, spiritually and socially. Mr. Peter Godinho said that the project is meant to promote tourism of foreigners coming to India. This would lead to moral degradation of the people and there was danger of their children being subjected to prostitution. He said that the locals would not benefit from this project as history shows from their experience with Esselworld. Gordon DSouza of Christian Spotlight who anchored the meeting urged the Commission not to let the natural beauty of Uttan-Gorai belt be tampered with. He said that this was only the beginning as the agitations would now be directed from other fronts such as the environmental, legal and agitational. The Commissions Vice Chairman Abraham Mathai said that the local people have their rights and if they were taken away a Nandigram like situation was sure to follow. Both Siddhique and Mathai asked the officials present to present a report to their seniors about the resentment shown by the locals against the SEZ plans. They promised to present a report to the Chief Minister and organize a meeting with him to impress on him the need to scrap SEZ in the belt. Stung by the Governments plan of setting up a Special Economic Zone in their homeland, the unrelenting Uttan-Goraikars continued to battle against it by organizing a series of massive protests. It started with the Rasta Roko on Gorai Road on Dec. 16, 2007, then the mammoth Rally on Uttan beach which Medha Patkar addressed on Feb. 4, 2008 and on Sunday Feb. 17, 2008 they forced Esselworld to pull down its shutters by blocking the creek with their boats and organizing a dharna in front of their gates. Over ten thousand locals from the ten affected villages poured into the streets in a massive show of strength and marched to Esselworld shouting slogans and holding placards protesting the setting up of a SEZ in their homeland. By doing so they took the battle into the enemys camp and have shown in no uncertain terms that they will not accept this plan that poses a threat to their livelihood, environment and culture. The locals won the battle even before their padyatra began from Gorai Church at 10.00 am. Mr. Ranade DCP who led the police - that was present in a big force and well equipped with water jets, barricades and stenguns announced the closure of Esselworld for the day and prevented picnickers from getting there. Meanwhile fishermen boats had quietly moved into the Gorai Creek to block Essel ferries from plying in the creek. However the dharna was peaceful and after four hours of songs, slogans and speeches the assembly felt satisfied that they had won the battle and dented the confidence of the developers who had planned to usurp their land. Men and women in their traditional attire perched atop bullock-carts and horse carriages made the dharna a colourful sight. A bullock-cart was used as an impromptu podium by activists for conveying their message to the captive audience. Even the parish priests of churches in the region came out strongly against acquisition of lands to set up an entertainment SEZ in the region. They said that it was a battle between greed and creed. The Esselworld owners should meditate at the Pagoda they have built so that they could rid themselves of desire which was the root of evil. They proposed that SEZs should be started in Vidharba where farmers were committing suicide. They despaired that people had to recourse to such agitations because of lack of lokrajya in the country. It was unfortunate that elected representatives had forsaken the people. While unbridled development was taking place in the form of building a Pagoda and residential quarters within the Esselworld complex, which falls in No Development Zone, the locals staying nearby were denied permissions to even repair their houses. The speakers gave a call to boycott Zee channels and Esselworld. The dharna was evidence of the fact that peoples power was greater than money power. One of the speakers also said that the police that were present in such large numbers should be set after Mr. Goyal, who was out to grab their lands, instead of standing on guard against a largely peaceful assemblage. They said that the people of Uttan-Gorai had taught a lesson to the whole world on how to fight for justice in a peaceful manner. Besides the NAPM, Dharavi Bet Bachao Samiti who had organized the dharna were supported by the BCS and CSF. 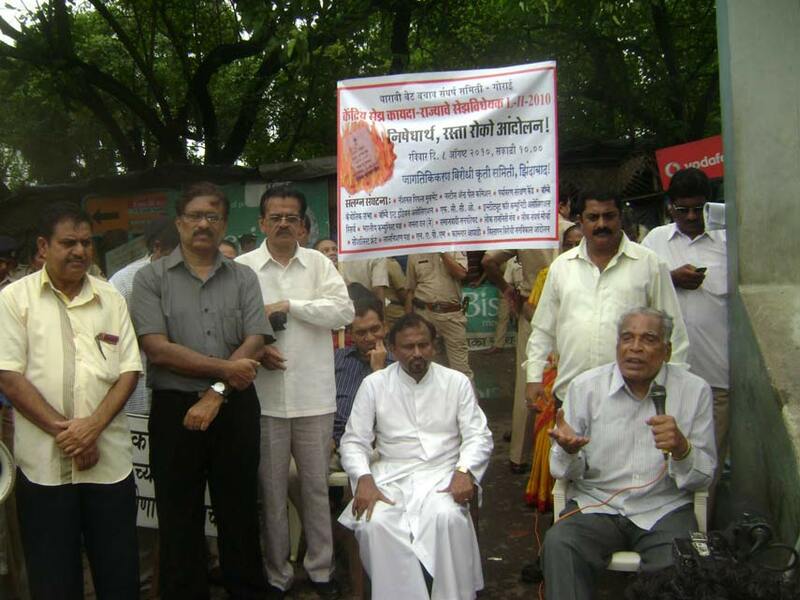 Simultaneously members of the Bombay Catholic Sabha organized a demonstration with placards and banners both at Marve Beach and Gorai Creek to show solidarity with the people of Dharavi Island in their battle against SEZ. RASTA ROKO AND BURING OF EFFIGIES ON GORAI ROAD. 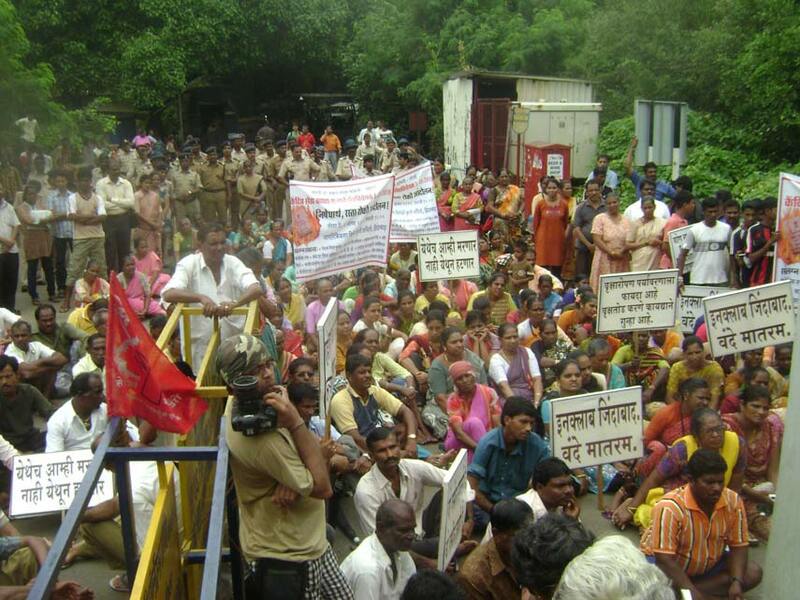 Over 3000 people carrying effigies of Mukesh Ambani and Subash Chandra Goel in a mock funeral procession marched from Chowk village to Uttan  Gorai Road Junction (Bhootbangla) to protest against the Maha Mumbai and Gorai SEZ on June 17,2008. There was a Rasto Roko on Gorai Road for two hours from 10.30 in the morning. Among the local leaders were Catholic priests who had come out in support of the agitation. For the Gorai SEZ Subash Chandra Goel of Esselworld had obtained in  principle approval which was valid for one year. Due to wide scale agitation and awareness of the locals he was not able to acquire any lands for his project. But he managed to get an extension of one year for putting up his final proposal. However this period also lapsed and but now he has succeeded to get a further extension of six months which would end on Oct. 4, 2008. Mr. Gopal Pillai, chairman of the Board of Approvals for SEZ had promised us that no further extension would be given for the SEZ when a delegation had met him at Delhi, said Gordon DSouza, Vice President of the Bombay Catholic Sabha. The locals are hell bent on not allowing the SEZ to come up on their lands. 1.25 lakh people are likely to be affected by this project. Among them are the fisher folk who comprise more than half the population. The remaining are farmers and salt pan workers. 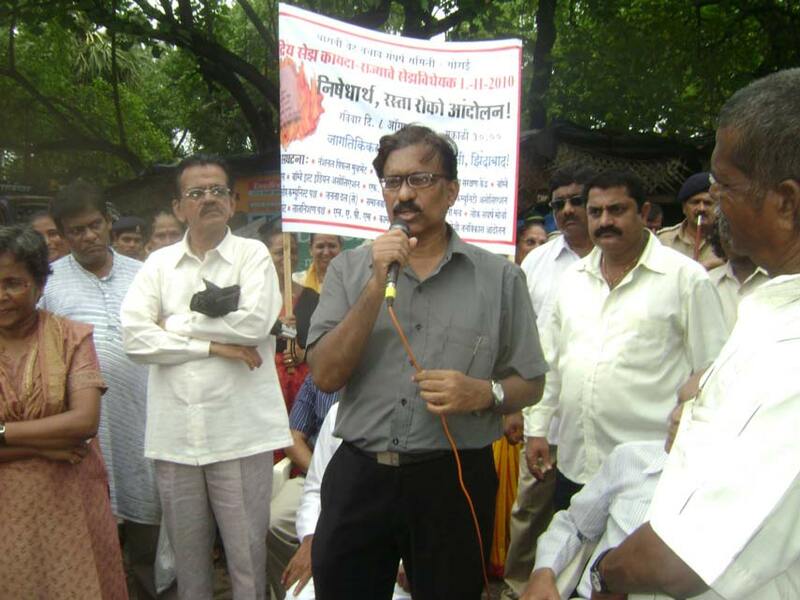 Joseph Gonsalves, president of Dharavi Bet Bachao Samiti spoke on why the ownership of lands should not change hands. He said that the locals would lose their occupations and would be dishoused if the SEZ came through. Besides the region was rich in culture and heritage as it is the home of the East Indians community, who are the sons of the soil. Gordon DSouza, said that Esselworld was trying to use backdoor methods to set up the SEZ. They were planning to obtain lands through government tenders as they were unable to purchase any from the locals. The locals have gone to Court to stop 1200 acres of this eco sensitive land (1000 of which are mangroves) from being given away for development of tourism projects. The Bombay High Court has granted a status quo order on the lands and the case would be further heard on June 25, 2008. The MTDC tender notice for giving away these lands on lease to develop tourism projects is bad in law as mangroves are notified as forests by a Court order dated Oct. 6, 2005 and the Ministry of Environment and Forests is asked to take over possession of mangrove lands. Chandrashekhar of NAPM said that these agitations would continue till Oct. 4, 2008 to demand that no further extension be given for the SEZ approval. 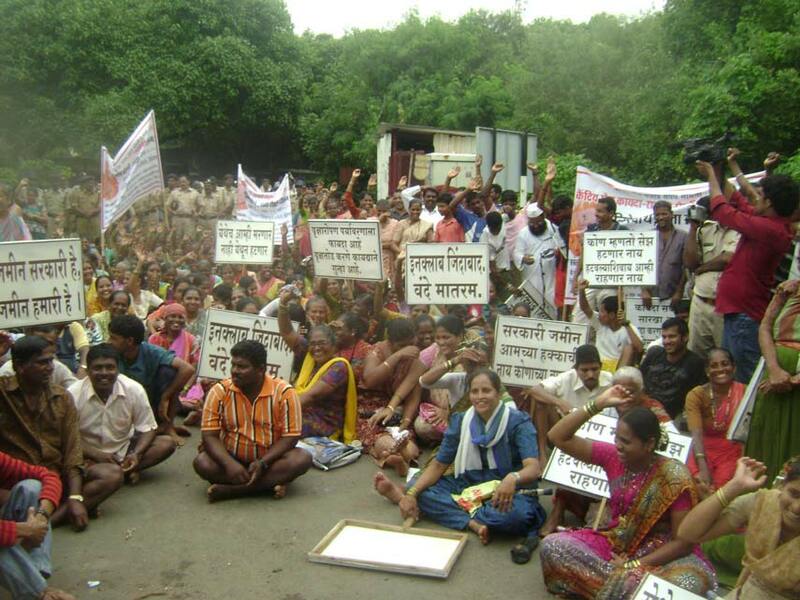 A similar Rasta Roko was organized at the same time on the Mumbai-Goa Highway at Vadkhal Naka to protest against the Maha Mumbai SEZ being developed by Mukesh Ambani. The people there are enraged that 22 irrigated villages in Pen taluka are brought into the SEZ in spite of the Government assurances that they would be kept out.